Hiram Newton Cudworth was born on 28 November 1859 at Sandwich, Barnstable Co., MA.1 He married Kate Maria Babbitt, daughter of Harrison Willard Babbitt and Marilla Theresa Converse, on 5 May 1891. Hiram Newton Cudworth died on 14 February 1934 at Lakewood, Cuyahoga Co., OH, at age 74.1 He was buried at Sagamore Cemetery, Bourne, Barnstable Co., MA. [S807] Find A Grave, online http://www.findagrave.com, Find A Grave, database and images (https://www.findagrave.com : accessed 24 March 2018), memorial page for Hiram Newton Cudworth (28 Nov 1859–14 Feb 1934), Find A Grave Memorial no. 103459372, citing Sagamore Cemetery, Bourne, Barnstable County, Massachusetts, USA ; Maintained by Caryn (contributor 47509429) . Marilla Converse Cudworth was the daughter of Hiram Newton Cudworth and Kate Maria Babbitt. From notes with photographs. Pliny's early days were passed on the farm attending the district school. Later he atended Monson & Shelburne Falls' Academies. He finished his limited and hard earned education at Appleton Academy, New Ipswich, NH. It was there that he met Lydia. Pliny H. and Lydia P. were enumerated in the 1850 Barre, Worcester Co., MA, federal census. He was a farmer, age 31, she was 31. Children in the household were Deborah P. 9, Caleb 7, Mary 3, and George F. 1. Also in the household was Mary Mathews 16. Pliny H. and Lydia P. were enumerated in the 1860, Barre, Worcester Co., MA, federal census. He was an auctioneer, age 41, she was 42. Children in the household were Deborah 19, Caleb H. 17, Mary Ann 13, George F. 11, Charles A. 9, and Lizzie N. 4. 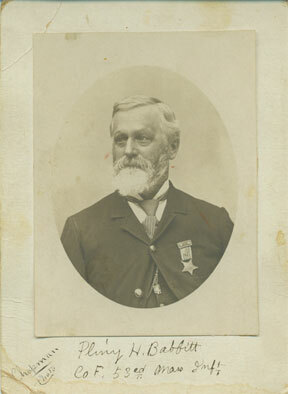 Pliny H. Babbitt, an auctioneer, enlisted 15 September 1862 at age 44, as a Lieutenant 1st Class in company F. 53rd Infantry Regiment Massachusetts and mustered out on 2 September 1863 in Camp Stevens, Groton, MA. Pliny was enumerated in the 1870, Barre, Worcester Co., MA, federal census. He was an auctioneer, age 52. Also in the household was Harriet M. Babbitt, 45, Marianna 23, and Lizzie N. 14; Ellen M. Newton 21, and Sheridan Tolman, 23. Pliny was enumerated in the 1880 Barre, Worcester Co., MA, federal census. He was a farmer, age 62. Also in the household were daughters Mary A. 33, and Lizzie N. 24. Pliiny was enumerated in the 1900 Barre, Worcester Co., MA, federal census, in the household of son-in-law, Harding Jenkins. He was a widower, age 81. The Babbitt genealogy lists 8 children of Pliny and Lydia, including twins that died young. [S174] William Bradford Browne, The Babbitt Family History: 1643-1900. From the account of the death of Marilla Theresa Converse. Harrison Wyman Deacon died on 30 August 1891 at Hubbardston, MA. Information from Sara Gertrude Skinner Ferchaud. Leslie Carsile Williams was born on 29 October 1894 at Sunflower, Washington Co., AL. He was the son of Lewis Harris Williams and Mary Eliza Skinner. Leslie Carsile Williams died on 30 June 1968 at Jackson, Clarke Co., AL, at age 73. Information from Sarah Gertrude Skinner Ferchaud. [S182] Social Security Death Index (on-line), Ancestry.com, SSDI, Ancestry.com, SSAN 490-01-9887.